Among the nine new areas that should be considered for historic preservation districts in Central Harlem are Astor Row at 130th Street between Fifth and Lenox Avenues, with its collection of semi-detached row houses. HARLEM — A swath of Central Harlem is being primed for landmarking under the first-ever comprehensive preservation plan for the area approved by the local community board this week. There are so many important buildings and sites in Central Harlem that are 100 years old or older that Harlem has room for nine potential historic districts, according to the plan, which was approved by Community Board 10 Wednesday. There are currently only two historic districts in Harlem — Mount Morris Park and Striver's Row — meaning only 3.6 percent of Central Harlem is protected under the designation, compared to 10.6 percent for all of Manhattan and 26 percent for the Upper West Side. "One of the critical things that we know is that Harlem in itself has very little designation, but we do have a concentration of a lot of older buildings," said Betty Dubuisson, chair of CB 10's Landmark Committee, at an earlier meeting about the plan. The CB10 preservation plan will now be sent to the Landmark Preservation Commission and elected officials to gather support for the report's recommendations. "By looking at it as a comprehensive plan, you can start mapping what you think you want the future of your community to be," said Simeon Bankoff, executive Director of the Historic Districts Council. "It can guide economic development, land use development and guide the area into a place where you want to live and work." Michael Henry Adams, a Harlem preservationist and historian who worked on the plan in his job as Community Cultural Associate for state Sen. Bill Perkins, said he hopes the proposal will prevent a repeat of what happened 15 years ago, when he recommended that several buildings be landmarked on an emergency basis. "Not every building, but most on that list, have subsequently been destroyed or are planned to be destroyed," said Adams, adding he had high hopes for the current preservation plan. "We are light years away from where we were 15 years ago." Among the nine new areas that will be considered for historic preservation districts is Astor Row at 130th Street between Fifth and Lenox Avenues, with its collection of semi-detached row houses. The row houses on the south side of the street are already individually landmarked, but the stately brownstones on the north side of the street remain unprotected. West 147th to 149th streets, between Adam Clayton Powell Jr. Boulevard and Frederick Douglass Boulevard, has a cohesive group of buildings with first-story white limestone and beige brick upper floors. From 130th to 133rd streets, between Lenox Avenue and Adam Clayton Powell Jr. Boulevard, 190 row houses were built before the turn of the 20th century and It is one of the first examples of row house neighborhoods in Upper Manhattan. Originally built for wealthy white families, it was also one of the first Upper Manhattan neighborhoods to become predominantly African-American. The board is also recommending an extension of the existing Striver's Row historic district from as far south as 135th Street and as far north as 140th Street, along with the planned extension of the existing Mount Morris Park Historic District. "This is good news," said Adams of the preservation plan. "This has been a long time in the making," he added. The idea for the plan began about five years ago when the rezoning of 125th Street drew attention to the fact that many important local landmarks sat unprotected. "Both the community and community board expressed a lot concern that we did not have enough of our district that was being preserved," said Dubuisson. There are currently 28 individual landmarks in Community Board 10. But others, such as the old Blumstein's building now occupied by Touro College, and the Harlem Branch of the New York Public Library at 124th Street, are potential nominees. Only two interior landmarks exist within Community Board 10 — the Apollo Theater and the Play Center Bath House at Jackie Robinson Park. Other potential interior landmark nominees include the Hansborough Recreation Center on 134th Street between Lenox and Fifth avenues, and Lenox Lounge, which is in danger of going out of business because of increasing rent. Central Harlem has no designated scenic landmarks — defined by the landmarks board as a feature or group of features that must be city-owned land with historic value. The board would like legendary basketball mecca Rucker Park to be designated as the area's first scenic landmark. 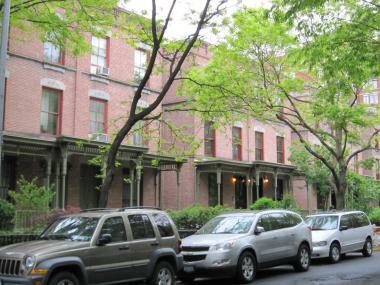 "You hear a lot of complaints about the other boroughs being under-landmarked," Bankoff said. "Frankly, Manhattan above 96th street ranks as an outer borough in that sense." The board also wants to explore the possibility of creating a Harlem State Heritage Area to help promote the culture and history of the neighborhood and attract investment. "I think there are potentially other individual landmarks out there," Adams said. "What this board is so rich in is an incredible history of incredible people." He named a number of unprotected sites, including a home of Vaudeville performer Bert Williams on Adam Clayton Powell Jr. Boulevard that is now being used as a beauty shop, as well as three homes where "King of Ragtime" composer Scott Joplin once lived. "This is our history," he added, "and it's highly important."